The Blue Mosque on the north side of Imam Khomeini Avenue was destroyed by one of Tabriz’s recurrent earthquakes. 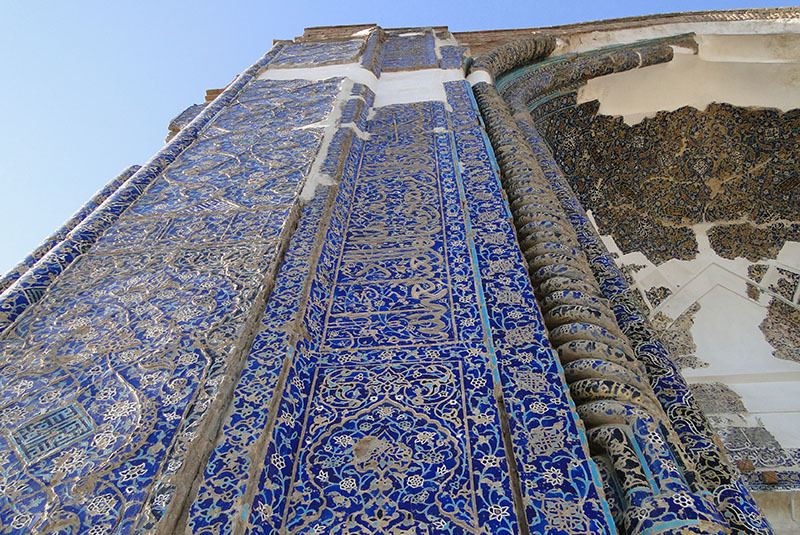 Because of the blue tiles used in the decoration of both the interior and exterior of the mosque, it has become to be known as the Turquoise of Islam. The Blue Mosque is known as Goy Masjed in Turkish, and Masjed-e Kabud in Farsi. Here, is the brief introduction on the history and architecture of this mosque. The Blue mosque of Tabriz was built upon the order of Jahan Shah the ruler of Kara Koyunlu dynasty which made Tabriz the capital of his Kingdom. His Kingdom covered major parts of modern Iran, Azerbaijan, and Turkey. When it was constructed in 1465, the Blue Mosque was among the most glorious buildings of its era, a masterpiece of Iranian decorative tile work. It survived one of the history's worst-ever earthquakes in 1727. However, it collapsed in a later quake in 1773, and therefore, today only a few pillars, parts of the outer wall and the main gate, and sections of the vaulted ceiling and a dome remain. The Blue Mosque was a member of a larger architectural complex called the Mozafriya Collection. This collection consisted of a mosque, a monastery, a courtyard, a library, and other parts, all of which were destroyed, and of all the buildings, just the blue mosque remains. The plan, unique in Iran, is comprised of a central square chamber covered by a dome and framed on three sides by a continuous arcade of nine domed bays. A domed sanctuary projects from the fourth, the qibla side. 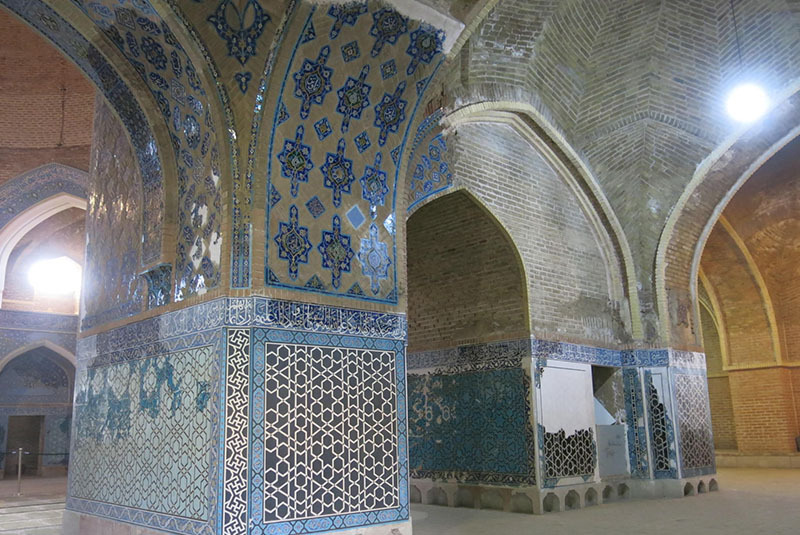 The mosque plan is a variant on the usual Iranian four-iwan courtyard style: the courtyard has been replaced by a large domed chamber with an entrance on each of the four sides. The mihrab is in a smaller room, also domed, once served as a private mosque for the Qareh Koyunlu shahs. On three sides of the main chamber are further vaulted rooms. Steps lead down towards Jahan Shah's tomb chamber but access would require some minor gymnastics. This rather original plan may be a result of local adaptation to cope with the colder, harsher climate of Azerbaijan. An entrance portal with semi-dome, on axis with the qibla, accesses the arcade, which forms a five-bay vestibule parallel with the façade. The plan bears comparison to the covered Ottoman mosques of Bursa and Byzantine church architecture. The closest comparable structure within Iran is the Masjid Shah in Mashhad. The Blue Mosque is named after its unrivaled tile decoration of which there is still evidence upon the ruined walls of the building. Both interior and exterior surfaces were once covered in a variety of tile revetment; remains of tile mosaic, under-glaze painted and over-glaze painted tiles, and luster tiles attest to the richness of the decorative scheme. The diverse Kufic, and Thuluth scripts, the arabesque patterns, and the chromatic compositions of these facades were created by Nematollah-ben-Mohammad-ol-Bavab, the famous calligrapher. The walls inside and outside had been covered with mosaic tiles. Patterns are rendered in subtle colors with extensive use of cobalt blue as a ground for inscriptions and arabesque designs in gold and white. The dome was a deep blue, stenciled with gold patterns. The damage to the building is attributed to an earthquake in 1776. Extensive rebuilding took place between 1950 and 1966. The dome over the central chamber dates from this period, as do the undecorated interior walls. The reconstruction efforts have been underway since 1973, they remain incomplete. Apart from its unique architecture and history, strategically placed windows illuminate the interior, allowing photography enthusiasts to play with shadow and light, all of which make the Blue Mosque a must-see during anyone’s visit to Tabriz.